To advance through the levels, the player has to pocket all the balls within a number shots and achieve a certain score. However, there isn’t any kind of predetermined order in which they should be pocketed. The Pocket Game is based on a “health bar” that displays the number of remaining shots. It depletes every time the player makes a shot that doesn’t result in a ball getting pocketed. It maintains the same number of remaining shots if one or more balls are sunk. At the end of each level, the number of pocketed balls in a row and the numeric order in which the balls were pocketed are analyzed and added as extra points to the score. It sounds confusing, but after playing the game a couple of times, it’s easy to understand the rules. This all means that Side Pocket gameplay isn’t about simulation, instead is a pool game with more of an arcade feel to it. 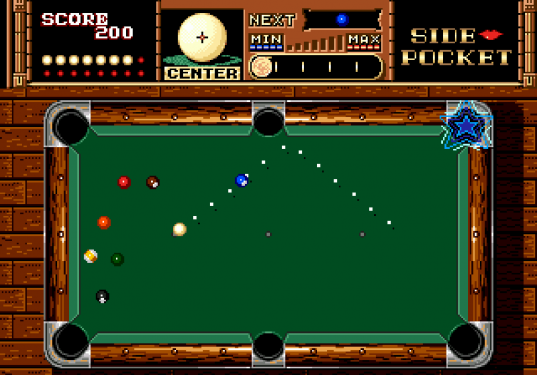 Other gameplay elements that makes Side Pocket stand out from the rest of other pool games are the power-ups, such as the random star that appears at the top of some pockets, which will give extra points if a ball is goes inside it; the Zone Pocket, that upon successfully sinking a ball in it, will add bonus points to the score or increase the “health bar”; Super Balls, that gain a ridiculous amount of momentum; Bonus Levels to replete your “health bar” and even some hidden Easter eggs. A screenshot of the game's screen, displaying one of the power-ups. The game also features a Trick Shot mode, with a simple and straightforward objective: clear the table with one shot to complete the stage. There is a total of 19 trick shots available, that can be completed at any order. After completing all the trick shot levels, the different pieces of the menu align themselves, composing the face of a woman. One of the 19 trick shots. Speaking of which, this is another element this game stands out for: it’s certainly aimed for a mature audience. Just look at the menus of the game, most of them are composed by an image of a woman, at an expensive place like a club or a hotel. That leads to the game graphics, which look very good, specially on the Genesis. Animations are fluid, and the pixel art detail is simply amazing. Since these images at the menus must have taken a lot of cartridge memory, no matter which level of the game, it’s always the same table made with the same velvet and the same type of walnut. Even the hardwood floor doesn’t change! It lacks some kind of feedback when the player advances through the game. Other than that, the game simply looks good. There are even some animations of the pool player taking a shot at the top right corner of the screen, adding a sense of human presence to the game: it’s not just a floating cue sinking the balls on different pockets of the table. Look at this game intro. It definitely makes you want to play the game. There are some annoying elements in this game. For instance, after the second table, it’s required to successful complete a trick shot to advance to the next level, even if the player has achieved the minimum required score. The problem is that a small number of these trick shots are not present in the Trick Shot mode, meaning you can’t practice them. So it’s a hit or miss, and the latter will make the player fail the current level, requiring it to be completed again, just to get another chance at the trick shot. This eventually frustrate many of the players. Arguably, there are some elements missing in the game, such as NPC opponents — a feature that was added on the next game of the franchise. Nevertheless, the game’s rules does not a require a opponent, and there is always the option to go for a multiplayer 8-Ball game against a human as the 2nd player. 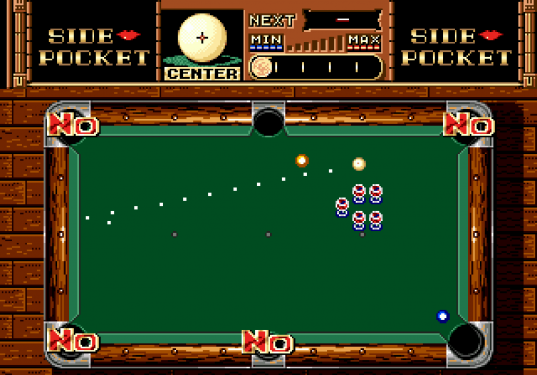 Overall, Side Pocket is technically well executed, offering a lot a variety for a game of it’s kind, with its differentiated rules, “health bar”, power-ups, bonus levels and trick shots, delivering a unique experience. It’s interesting to see a game that was aimed for an adult audience, specially in the 90’s consoles. Side Pocket is somewhat based on reality but focused more in making a good video game than making the perfectly accurate pool simulator. Added with that, the great graphics, music, and the allusions to a millionaire lifestyle, surely gets the player entertained for some time. Regardless of it’s qualities, it can be annoying and frustrating at some points, even for the more experienced players. 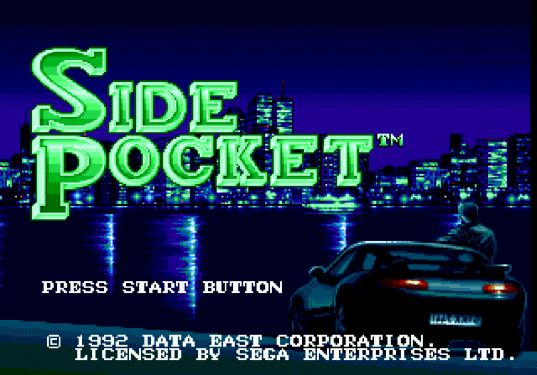 Still it’s a good and fun game for everyone that owns a Sega Genesis.